Orlando has a really nice selection of Vietnamese restaurants in the Mills 50 District. That's good since Vietnamese food is generally really tasty. Once outside Mills 50, Vietnamese food gets a bit harder to find. I can only think of a couple Vietnamese restaurants in Seminole county, so I was happy when I saw that a new restaurant had opened in Altamonte Springs called Viet-House. The tiny restaurant is located in a building behind a gas station at the intersection of 436 and 427. You order at the window and eat at some nearby picnic tables. There isn't an inside here. Viet-House seems to specialize in banh mi but also offer soups and appetizers. I found out the hard way on my first visit that they close at 4:30. When I returned on another day to give them a try, I had their combination banh mi. The sandwich consisted of various types of sliced pork products (I'm going to hide my ignorance of Vietnamese meats by leaving it at that), pate, pickled vegetables, lettuce, tomato, and cilantro on a French baguette. The banh mi was good and was very filling for under $5. I also shared these summer rolls, filled with shrimp, pork, noodles, bean sprouts, cucumber, and basil. They were somewhat messy to eat, but tasty. Eating Vietnamese food in a gas station parking lot is definitely a different experience than eating in one of the nicer Vietnamese restaurants in Orlando, but the food was good regardless. A banh mi sandwich does seem like a perfect type of street food, so perhaps this is actually an ideal location for the food! This little fast food gyro place near the fairgrounds in Pine Hills seems to be popular with postal workers. The restaurant was filled with mostly mail carriers on their lunch breaks when I visited. I ordered a gyro, filled with sliced lamb, lettuce, tomato, onion, and tazitiki. The sandwich was really tasty and they were generous with the toppings. Brickhouse Tavern and Tap is one of the newer restaurants on International Drive near the convention center. This place was definitely a chain, but this is the only Brickhouse I've ever come across. The restaurant is modern looking inside with long couch-like booths leading up to a large fireplace. The clean design of the restaurant was sort of offset with the multitude of TVs hanging overhead all playing the fishing channel, but let's talk about the food instead of poorly placed TVs. I had the Italian sausage hoagie. This was a good sized sandwich, stuffed with sausage, peppers, onions, spicy tomato sauce, and topped with cheese. Tator tots were served as a side. For the most part, the sandwich tasted good although I did have an issue with the bread. The bread was really soft and mushy, similar to a hot dog bun. So much so that the bread got soggy really quickly from the sauce on the sandwich. The soggy roll fell apart when I tried picking up the sandwich, thus defeating the normal sandwich eating method. The rest of the hoagie was good, but the bread was bad. Someone else at the table ordered chicken & waffles. Perhaps this would have been a better choice! 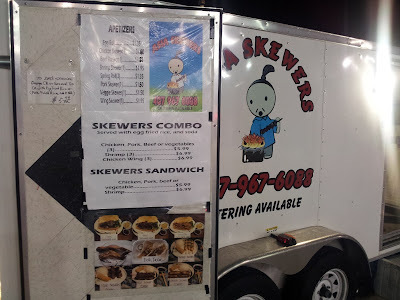 Late one night I was driving along University Boulevard in Winter Park and noticed a food truck called Asia Skewers sitting in the parking lot of a Citgo gas station. Suddenly my mind was filled with memories of exploring Flushing's Chinatown and getting skewers of delicious meat from the Xinjiang BBQ Carts. I quickly turned around and pulled in to try Orlando's version of Asian meat on sticks. Asia Skewers had menu consisting of skewers of chicken, beef, shrimp, pork, wings, or veggie. Each was under $2 and were also available as combos coming with fried rice or as sandwiches. They didn't have any of the exotic meats that the Chinatown skewer carts have, but I wouldn't really expect it in the suburbs of Orlando. Since I had already ate dinner earlier in the evening, I decided to just get a couple of individual skewers, namely chicken and shrimp. After a few minutes of cooking, I received these two boxes along with two sauces. I went for the chicken first. The thin strip of chicken impaled on a stick was very tasty, not needing any of the provided sauce. It sort of reminded me of the chicken skewers sometimes found on Chinese buffets, only better. Unlike the Chinese buffet skewers, this chicken was actually edible rather than chewing on a piece of leather on a stick. I would by all means get the chicken skewer again. The shrimp skewer was also good, consisting of four mid-sized shrimp. Again, these had plenty of flavor and I didn't touch the sauces that came along with the skewers. It seemed like the chicken provided more food for the priced, but regardless, two skewers for three dollars and change is still a good deal. 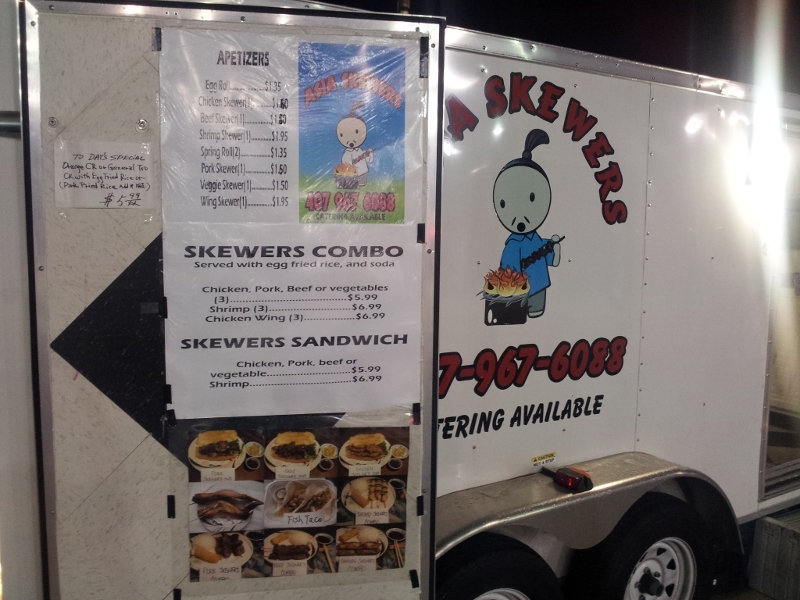 I would definitely stop by Asia Skewers again. They are apparently open from 5 pm to 5 am, so I'll need to keep them in mind if I'm looking for a really late night/early morning dinner when I'm on that side of town! Yesterday was National Peanut Butter Cookie Day. I couldn't find how or why June 12 was assigned to peanut butter cookies, or why it is only national rather than international, but the holiday is a good reason to eat a cookie. I happened to be at Disney's Boardwalk Hotel and decided to find a peanut butter cookie to celebrate. We tried the Boardwalk Bakery first. They had a nice cookie selection, but peanut butter was nowhere to be found. Not that easily defeated, we moved a few stores down to Seashore Sweets'. On the top shelf of their pastry case, they had a giant Mickey Mouse shaped peanut butter cookie. It was horribly expensive for a cookie at $5.49, but this was in a Disney hotel and it was a cookie holiday, so the cookie was purchased. The cookie was huge, but it was also a bit disappointing. It was horribly dry in the part not covered in chocolate. The person who I shared it with described the cookie as being similar to eating a dog biscuit. Not sure how many dog biscuits she has eaten to know this, but I was expecting better from a Disney bakery. Our local supermarket chain has better peanut butter cookies. I had lunch one afternoon at Umberto's of Long Island in Boca Raton. I am assuming that this restaurant is connected with the nearby Umberto's in Deerfield Beach, although I wonder how much connection there is to the actual Umberto's restaurants in Long Island. We had asked our waitress which Umberto's in Long Island the restaurant was connected to and she seemed very confused and didn't know. Uniformed waitress or a restaurant in Florida trying to get New York snowbirds to come to their restaurant because of the name? Not sure, but I would hope they really are connected if they have awards from Long Island Press hanging in their windows. I had the lunch special of two slices and a drink. To keep it interesting, I had a slice of grandma pizza and a slice of plain cheese. Both were okay, definitely much better than the messy slices from the Deerfield Umberto's. The grandma slice was my favorite of the two. Although the slices were okay, they did have a somewhat burnt taste. I think Umberto's needed to desperately clean their ovens. Overall, the pizza here wasn't bad. It would have been better without the sooty, dirty oven taste, but otherwise this Umberto's served some pretty decent pizza. Besides, anywhere that serves grandma pizza can't be bad! A couple months later I visited Le Macaron in downtown Winter Park to finally try a French macaron. Le Macaron is a little shop tucked away in an alley off Park Avenue. Macarons are the main focus of this shop, but they also had a very limited selection of chocolates for sale as well. There was a gelato case too, but it was empty on the day I visited. At $1.80 each the macarons were a bit expensive for the small size of the pastry. Regardless, I got a box of six macarons. Picking out the flavors got a little weird though when the grumpy employee helping us interrupted filling our box to offer her friend that had walked in after us a free sample of a macaron. Besides being a little sour that we didn't get offered any free cookies, our macarons were soon taken home to be tasted.